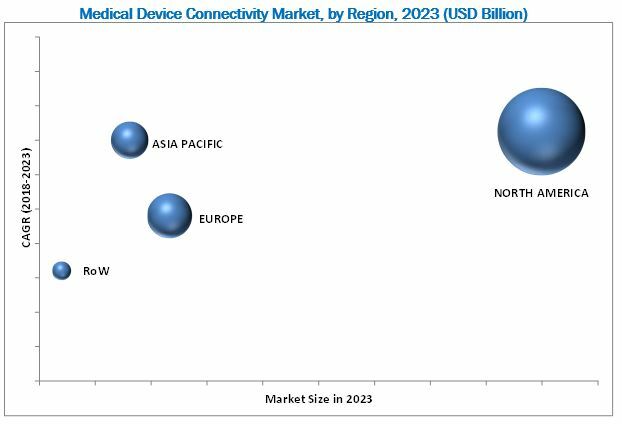 [205 Pages Report] The medical device connectivity market is projected to reach USD 2,670.3 Million by 2023 from USD 763.1 Million in 2017, at a CAGR of 23.2% from 2018 to 2023. Rising healthcare costs, the growing adoption of electronic medical records, strong government support and initiatives, increasing need for data analytics in healthcare, and growing focus on the quality of care and patient safety are the factors driving the market connectivity across the globe. Top-down and bottom-up approaches were used to validate the size of the global medical device connectivity market and estimate the size of various other dependent submarkets. Major players in the market were identified through secondary sources; directories; databases such as Hoovers, Bloomberg Businessweek, Factiva, and OneSource; journals; and publications from associations such as American Health Information Management Association and Ohio Health Information Management Association; and their market revenues were determined through primary and secondary research. Primary research included extensive interviews with the key opinion leaders such as CEOs, directors, and marketing executives. The percentage splits, shares, and breakdowns of the product markets were determined using secondary sources and verified through primary sources. All possible parameters that affect the market covered in this research study have been accounted for, viewed in extensive detail, verified through primary research, and analyzed to get the final quantitative and qualitative data. This data is consolidated and added with detailed inputs and analysis from MarketsandMarkets and presented in this report. The global market is fragmented and highly competitive, it consists of several large to medium-sized companies that compete with each other for increasing their foothold in different segments of the market. The top five players operating in this market include Qualcomm Life (US), Cerner Corporation (US), GE Healthcare (US), Philips (Netherlands), and NantHealth (US). Other leading players in this market include Medtronic (Ireland), Cisco Systems (US), Infosys Limited (India), Digi International (US), Bernoulli Enterprise (US), and Lantronix Inc (US). The market has numerous large and medium players operating at both global and regional levels as well. The leading players are continuously developing new and innovative services to maintain their shares in the global market. Currently, there is a growing need to integrate large amount of electronic data generated across different departments within healthcare systems in order to maximize the utility of HCIT solutions deployed within healthcare organizations. Health information exchange solutions, HCIT integration tools, and medical device connectivity solutions are increasingly being used for this purpose. Apart from organizing and managing patients’ records and documents, HCIT solutions are being deployed for providing access to patient information to all departments in a healthcare organization, as well as to facilitate information exchange with other healthcare providers and payers. The growing need for interoperability and integration is resulting in technological advancements in the medical device connectivity market. A growing number of solution vendors in this market are either offering medical device integration solutions or interface devices that are vendor-agnostic and compatible with third-party healthcare solutions. Vendor-neutral MDI solutions help integrate data from multiple devices throughout the hospital enterprise by translating it as per the EMR format requirement and sending it to patient records. Over the past few years pay-for-performance contracts based on quality, patient satisfaction, and utilization is dominating care delivery modes in the health continuum. There has been a shift towards value-based care to better align the incentives of patients, providers, and payers who usually finance care. This new approach to medical billing is drastically changing the relationship between the vendor and the customer, converting the one-time transaction into a long-term customer relationship. This has increased attention placed towards establishing an interoperable health system for measuring patient-reported outcomes and patient satisfaction scores by creating a connected healthcare system. This situation has proven favorable for the growth of medical device connectivity solutions and their use in allowing patients to communicate effectively with caregivers. Connected health setups also allow healthcare organizations to manage and track payments for patients based on the outcomes. In the payment-for-outcomes model, interconnectedness offers health systems the strategic expertise needed to profitably manage operations under healthcare reforms, reduce margin pressure, and improve the overall patient experience. Fueled by digitalization, constant software updates, and technological developments in healthcare, medical device connectivity solutions are increasingly being utilized to create completely digitalized and interoperable health setups to aid electronic data transmission and reduce administrative costs. In 2017, the MIPS of the Medicare Access and CHIP Reauthorization Act (MACRA) replaced the existing Medicare quality programs with one program. These programs include the Physician Quality Reporting System (PQRS), Value-based Payment Modifier, and Medicare EHR Incentive Program (Meaningful Use). MIPS scoring is based on four performance categories—quality, resource use, clinical practice improvement activities, and meaningful use of certified EHR technology. In 2017, Qualcomm (US) dominated the global medical device connectivity. The company offers digital connectivity technologies and networking solutions for healthcare organizations. The company provides robust medical device connectivity solutions and services to hospitals, clinics, home healthcare, and private diagnostic centers. The company continuously strives to improve and enhance its existing portfolio by introducing new products, entering into collaborations & agreements, and acquiring other players. To maintain its strong foothold in the medical device connectivity market, the company focused on inorganic growth strategies such collaborations, agreements, and acquisitions, for example, Qualcomm Life entered into a strategic licensing agreement with PeriGen (US) in 2018 to distribute PeriGen’s suite of intelligent care applications, an early warning platform for obstetrics integrated with Qualcomm’s medical device connectivity solutions. In September 2015, Qualcomm Life Inc. acquired Capsule Technologie (US), a leading provider of digital connectivity devices and networking solutions for clinical data integration and management. This helped the company to deliver comprehensive solutions and enhance its product portfolio in the medical device connectivity market. AI systems are equipped with predictive analytics software that uses variables of statistical techniques such as data mining, predictive modeling, and machine learning algorithms on available data sets (both new data and historical data) for prediction and forecasting of future events or otherwise unknown events. Such predictions also help in avoiding cyber-attacks by generating dynamic threat models from existing data silos. Through M2M systems, relevant patient data, including test results and real-time monitoring can be made available to all stakeholders simultaneously. This integration helps improve healthcare outcomes by radically increasing the efficiency and efficacy of treatment regimens through real-time remote patient monitoring. The implementation of AI gives accurate and efficient data to the healthcare service provider. It helps reduce errors generated by manual methods of interpreting reports. Stakeholders in this market such as chipset companies, healthcare service providers, and software companies are collaborating to help in drug development, medical imaging interpretation, treatment plans, and precision medicine based on AI. Such collaboration and the rising interests of stakeholders in achieving semantic interoperability is likely to propel the adoption of medical device connectivity solutions for creating a fully interoperable healthcare system and harness the complete benefits of M2M systems. What are the new growth avenues for medical device connectivity market in the next five years? How medical device integration would change the future of healthcare interoperability? Most of the vendors have opted agreements, collaborations, & partnerships as the key growth strategies. Where will it take the industry in the mid to long term in terms of innovation and market growth? What are the growth strategies and strengths of market players impacting their market positioning? 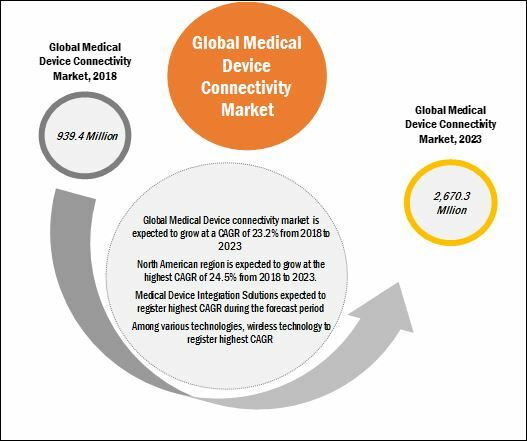 The medical device connectivity market is projected to reach USD 2,670.3 Million by 2023 from USD 939.4 Million in 2018, at a CAGR of 23.2%. The growth in this market is attributed to the increasing penetration of EHRs & health information exchange systems in healthcare organizations, growing focus on care quality and patient safety, healthcare IT initiatives driving the integration of medical devices with hospital information systems, and the growing need to curtail healthcare costs through a connected healthcare environment. The market in this report is segmented by product & service, technology, and end user. This report also provides market information on major regional segments of the market, namely, North America, Europe, Asia Pacific, and the Rest of the World. Based on product and service, medical device connectivity solutions dominated the market in 2017. The large share of the medical device connectivity solutions segment can be attributed to the growing digitization in the health continuum, increased adoption rate adoption of EHRs and other interoperability solutions in healthcare organizations in emerging countries, and the increasing need to curtail healthcare costs while delivering quality patient care. By technology, the wired technologies segment accounted for the largest share of the medical device connectivity market in 2017. This dominant share is mainly attributed to the various advantages offered by wired solutions such as better physical control, enhanced data security and reliability, and high-speed networked connectivity. On the basis of end users, the global market is segmented into hospitals, imaging and diagnostic centers, home healthcare, and ambulatory care settings. In 2017, the hospitals segment accounted for the largest share of the global market. The growth in this end-user segment can be attributed to factors such as the improving healthcare infrastructure in Asia Pacific, rising need to improve the operational efficiency of healthcare organizations, and improving patient and financial outcomes. In 2017, North America dominated the global market. Growth in this market can mainly be attributed to the strong IT infrastructure in the region, increasing investments and regulatory mandates favoring the implementation of eHealth solutions, presence of large healthcare IT companies, and increasing need to curtail healthcare costs. The North America region is also expected to grow at the highest CAGR during the forecast period. However, various interoperability issues, lack of standard interfaces, and the high cost of ownership of these systems are some of the factors that are likely to hinder the growth of the global market to a certain extent. The players in the market include GE Healthcare (US), Qualcomm (US), Cerner (US), Philips (Netherlands), Medtronic (Ireland), Cisco Systems (US), Infosys Limited (India), Digi International (US), NantHealth (US), Bernoulli Enterprise (US), True Process (US), iHealth Labs (US), and Lantronix (US).